WHAT IS A HAM CALL SIGN? WHO CAN GO FOR HAM RADIO? This was the first organisation to start distance education course for ASOC examinations. KARL is a non-profit organisation formed in 1980 devoted to the promotion of Amateur Radio, and now has more than 175 life members. It is another leading organisation in India which provides technical support to the newly licensed hams. The person behind this club (VU2ARD) is Dr.Ashotosh Singh, VU2IF. He is the first ham from India who was sent to Antarctica by the Govt. of India during its 1983-84 expedition. Equipment and journals produced by his club maintains a professional standard. Name of the ham radio journal published by him is SPARK. Novice can surely hope to get technical help from this club which is required to come-on-the air after getting a ham licence.The popular Transceiver developed by Dr. Ashotosh (VU2IF) is ATS-1 (basically meant of voice and morse code communication on 20m short wave band). ARSI is the leading ham radio organisation in our country instrumental in organising the hams of our country. ARSI is also the representing body of the odd 15,000 Indian ham radio operators at International Amateur Radio Union IARU). The Research Wing of ARSI (Electronics Research Association) provides technical know-how and assembled ham radio kits. Name of ARSI journal is “Ham Radio News”. ARSI runs a QSL bureua to handle in-coming & outgoing QSL cards of Indian hams. Indian Institute of HAM (IIH) has brought out a unique Callbook containing 12,000 callsigns with address, Telephone, e-mail address. The copy is obtainable at the cost of Rs. 150/- (including postage) by Demand Draft favouring INDIAN INSTITUTE OF HAMS, Bangalore. SPAR is another active organisation which pioneered many ham radio popularization activities. Name of its journal is “Zero-Beat”. BSG is also instrumental in providing training to their members as well as organising Jamboree-On-The-Air (JOTA)- an International event held every year when Children from all over the world are provided to do on-the-air radio communication through ham radio. 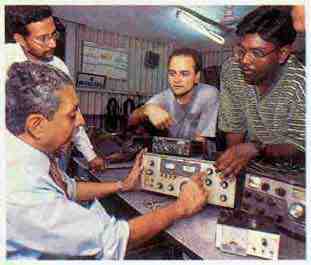 Bangalore Amateur Radio Club (BARC) is another leading ham radio club in India. It is one of the most active ham radio clubs in the country which also brings out a monthly newsletter besides providing various supports to the ham radio operators as well as the novice. The club was established in 1959. E-mail addresses of VU2ARC: vu2arc@hotmail.com, rfcom@vsnl.com or vu3icc@qsl.net.